One of the best sources of information I’ve found was right there on my blogroll, journalist Emily Green’s Chance of Rain. In concert with KCET, Emily is writing an amazingly detailed series bristling with helpful links and step-by-step instructions for those wondering what to do with their lawns. Definitely read Emily’s After the Lawn series before making a call to any lawn removal company that’s eager to snap up your rebate dollars in exchange for wall-to-wall gravel. Amidst all the finger pointing and accusations, at least we’re beginning to talk about our water situation. Ironically, after decades of denial, we just can’t seem to shut up about it now. This entry under the Dot Earth blog at The New York Times rounds up dozens of articles for background reading. So, yes, I’ve been reading up on the politics of the recent water restrictions. Because it’s not like we need more information on how to design dry gardens. Reaching into my bookshelf, I can pull out Beth Chatto‘s The Dry Garden, a chronicle of the 30-year-old garden she’s made in East Anglia, England, supported on rainfall alone. Then there’s Bob Perry’s landmark resource Landscape Plants for California Gardens. Lambley Nursery in Australia is also planting display gardens sustained on mostly rainwater. At home I’ve been tweaking the garden the past few years to accommodate drier conditions anyway, and our water bill is consistently below average. Granted, smaller properties like ours will have an easier time adjusting to restrictions. What lawn we inherited when buying the house was removed over 20 years ago. I’ve never been emotionally attached to closely cropped, bright green turf. But both neighbors to the east, who cherish their front lawns, have been quietly irrigating them with grey water for years. 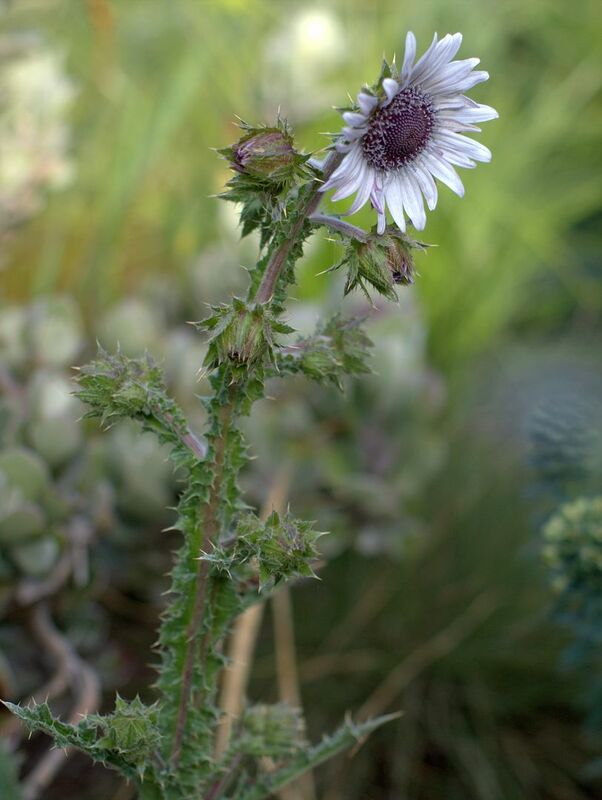 Berkheya purpurea, brought home from Cistus last summer, is a riveting, prickly daisy out of South Africa. One of countless examples, native and exotic, of gorgeous plants blithely indifferent to dry conditions. The literature cites berkheya’s habitat as stream banks, so we’ll see how tough it really is. Once established, anything tap-rooted has a big advantage. Hymenolepis parviflora, a dry-tolerant shrub with chartreuse umbels. Nature is a genius. In the past few years a lot of perennial/biennial/annual umbels have passed through the garden, the toughest probably being cenolophium, melanoselinum, yet even they needed pampering. This one, however, is the real deal. Hymenolepis is a short-lived shrub from So. Africa that will probably need to be renewed from cuttings in a few years. I’m cool with that. 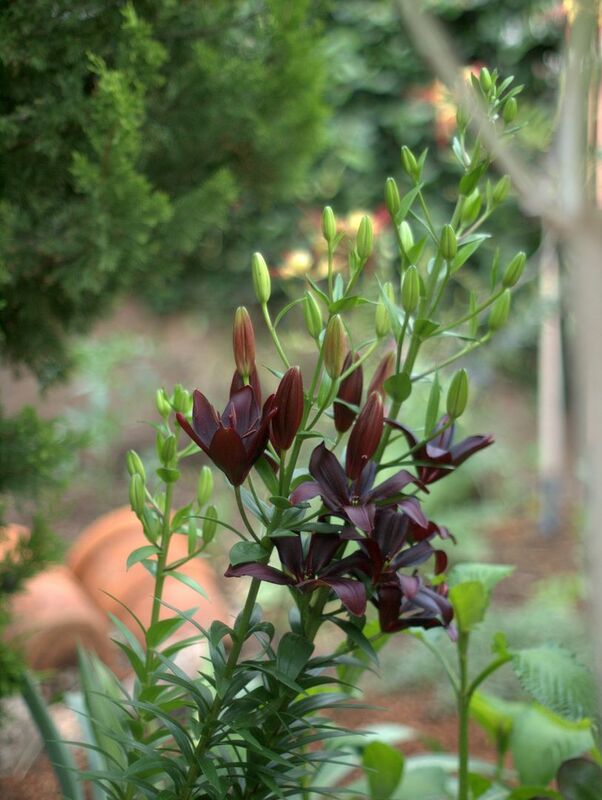 Lily ‘Black Charm.’ Fortunately lilies love container life. I find it makes better water sense to grow them in pots to provide the even moisture they crave than in the ground. The bucket collecting water from the shower is a steady source for container plants now. 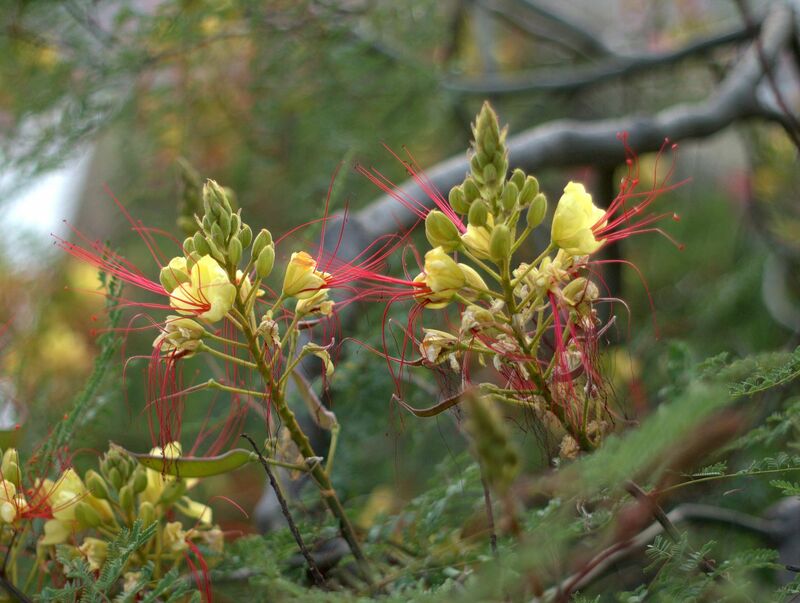 Seeing the Desert Bird of Paradise in rampant bloom wedged into the heat-reflected, bone-dry parkways along Long Beach City College set off a county-wide search for a source. The City College’s Hort. Department sold all their stock at their recent plant sale, but one local nursery had a couple plants. 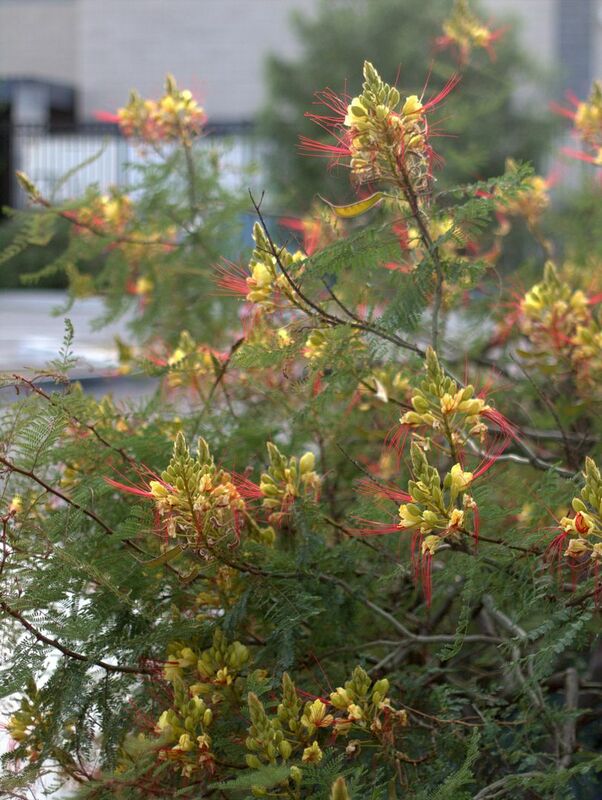 I replaced Salvia ‘Amistad’ with Caesalpinia gilliesii. I know Sunset is marketing this salvia as waterwise, but I’d planted mine far from the hose bib, and it was showing some stress. Verbascum in Dustin Gimbel‘s garden, seed collected on his recent trip to Italy. He gave me two of these wavy-leaved mulleins, possibly V. undulatum. 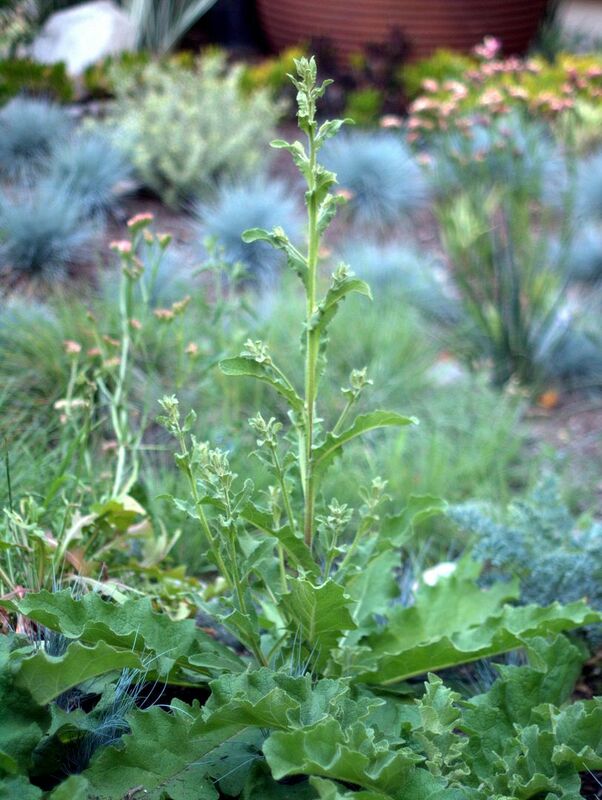 Verbascums are classic perennials for dry gardens. Water garden out, agave in. 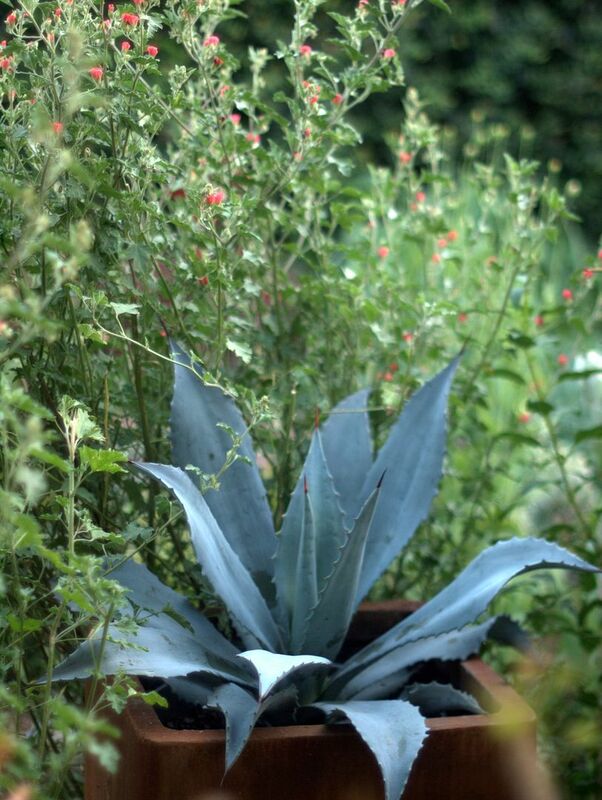 Formerly a small water garden, now a cache pot for Agave franzosinii. Surrounded by the unstoppable globe mallow Sphaeralcea ‘Newleaze Coral,’ a hybrid developed at Hopley’s in the UK. Planted last fall, I’ve cut back and thinned the globe mallow three times since mid winter. 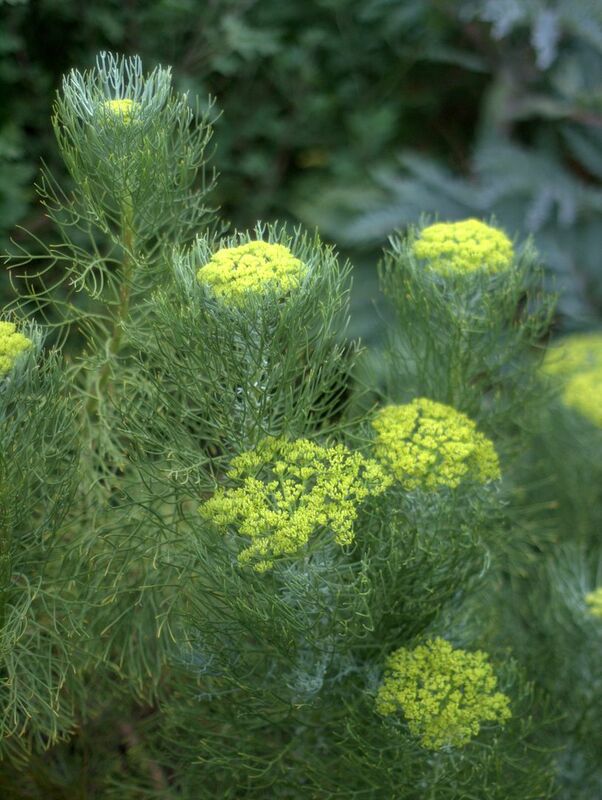 It’s never stopped blooming and, because of its vigor, I purposely avoid adding water. One last point, an important one to keep in mind. It’s no big surprise that trees are a constituency without much representation at the water restriction negotiations table. I vigorously applaud Emily Green’s emphasis on prioritizing irrigation for our trees. 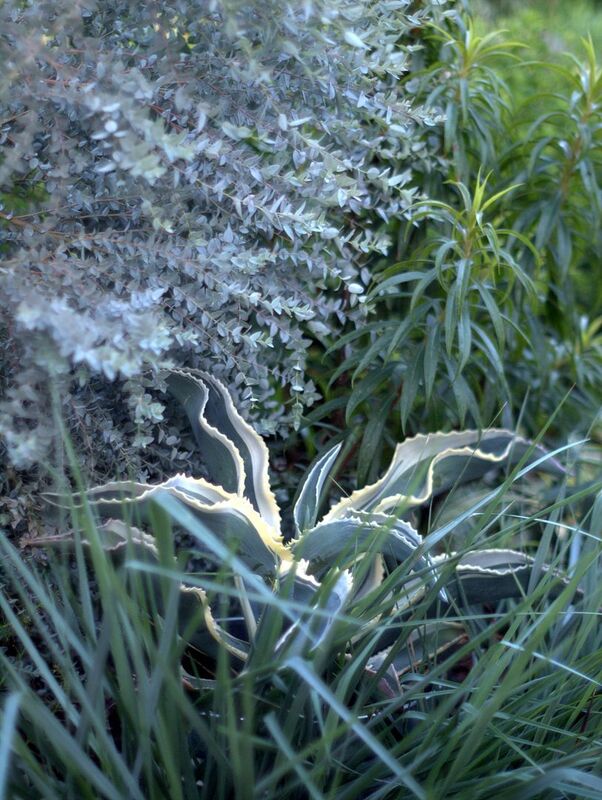 This entry was posted in agaves, woody lilies, books, Bulbs, climate, clippings, Plant Portraits, pots and containers and tagged Agave franzosinii, and Bart O’Brien, Australia, Berkheya purpurea, Beth Chatto's The Dry Garden, Bob Perry, Caesalpinia gilliesii, California drought, Carol Bornstein, Cistus Nursery, David Fross, dry garden, Dustin Gimbel Second Nature Garden Design, Emily Green Chance of Rain, Emily Green's After the Lawn, Hymenolepis parviflora, KCET In-Ground Gardens, Lambley Nursery, Landscape Plants for California Gardens, lawn rebate programs, Long Beach City College Dept of Horticulture, Mark Bittman, Pacific Horticulture, Reimagining the California Lawn, Sphaeralcea 'Newleaze Coral', Verbascum undulatum. Bookmark the permalink. Thanks for the information and the links. I too have water on the brain – I’ve even had dreams about rain collection of late. As additions to your resources, you might want to look at the Summer-Dry blog (summer-dry dot com), which Jane of Close to Home called my attention to a few months ago. The book, “Plants and Landscapes for Summer Dry Climates” (advertised on the site and put out by the East Bay Municipal Utility District) is also very good, even if it’s SF-focused. My area faces a 35% water reduction target and, despite action on all fronts, I don’t know how we’re going to meet that without letting some areas of the garden die. Thank you for compiling a list of useful resources. Even for those of us who have been working towards a water-wise garden for years, it’s not easy coming to terms with the new normal. I must get a Berkheya purpurea. I saw you pick it out at Cistus; why didn’t I get a few myself? Sphaeralcea ‘Newleaze Coral’ is a workhorse. Fast growing, loves the heat, and makes do with little water. Caesalpinia gilliesii has been a standout in my new desert bed. Very fast growing, and blooming non-stop between now and late fall. @Kris, I do have Summer-Dry in my blogroll. From what I saw when you gave me a tour recently, you’re definitely on the right track to meet the quota. @Gerhard, I always wonder if those links on my NYT acct will be accessible by all — hope they are. What a flood of info came out! Just read your blog and it looks like you’re heading to Portland again this summer, so you’ll get the opportunity to nab a berkheya. I’ve cut that sphaeralcea back by at least half. Its vigor is kinda scary, but that’s what we need in these drought-challenged times. Yes, I read somewhere else that ALL 39 million CA residents use 12% of the water–exactly the same amount as almonds. Ah, it was NYT, 4/1/2015 “How water cuts could affect every community in California”. Interesting links, thanks. I have the EBMUD book, it’s a good one. Could you identify the gray/blue plant in the upper left corner of the last picture? It’s beautiful. Love your blog! Thank you. @Hoov, these will be interesting times ahead, that’s for sure. You have the right kind of garden for surviving the drought. And it’s great that Californians who’ve never given their water use a second thought are now obsessing over it. But for those who’ve been saving, it must seem onerous to have to cut back more when you’ve already cut back so much.